The Weber Silver One-Touch is a beautiful charcoal grill and an excellent option for the charcoal chef. It is, compact, powerful, and simple to use. The kettle-style grill features a large 363 sq. inch cooking surface, which is capable of handling a significant quantity of burgers, dogs, and veggie skewers. The 22″ diameter cooking grate is made of heavy-duty plated steel, and the bowl is made of porcelain-enameled steel, is rust and heat resistant, and is designed for easy cleanup. It is not hinged but sits nicely on the base. The handle is made of glass-reinforced nylon and is designed to be used while the grill is hot. The unit has wheels for easy movement when necessary, and there is a one-touch cleanup door at the bottom of the grill which sends ash automatically down into the aluminum ash catcher for later disposal. There are two grates for heat control on the Weber Silver One-Touch Charcoal Grill: one at the top, and the cleanout on the bottom. The two can operate concurrently to control temperature flows through the grill, and when both are closed, the fire is quickly extinguished. The Silver One Touch is a good grill for those looking for a solid charcoal grill without too many extras. 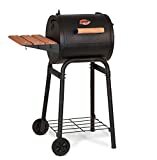 The CharGriller 1515 Patio Pro Charcoal Grill is a really cool looking unit, with a wood table tray and black cast iron barrel-shaped body. The Patio Pro is a very rugged-looking with its solid, retro design. The 1515 features a large cooking surface, clocking in at approximately 250 sq. inches of grill space and is capable of handling the whole family’s dogs and burgers at once. It features a wood handle that remains cool during the cooking process and has attached wheels for easy movement around the patio. The 1515 has a hinged door, a double steel bottom, and the side air vent system works well to balance out temperature across the grill for easy cooking. The instructions to assemble the unit are a bit difficult to decipher, and assembly is not as easy as is the case in some of the other units, though the unit is solid once assembled. After the unit is assembled, it is necessary to coat the grill in vegetable oil and to heat for two hours at 300′ to seal prepare the grill surface for cooking. When its time to clean the grill, the ashtray box slides out, and ashes can be pitched into the trash for easy disposal. The CharGriller Patio Pro is a solid, well-made grill made in the USA. Next up we have the Char-Broil Offset Smoker American Gourmet Grill. This unit is a combination of a charcoal grill, smoker, and BBQ grill. It features a large cooking area made of black porcelain-coated metal, clocking in at 605 sq. inches for the main grill, and an additional 128 sq. inches in the firebox area (the part shown on the left-hand side of the above photo). It also features robust steel construction and large 8″ wheels to enable easy movement. The offset heat, smoke, and flavor allow for a good deal of food to be cooked at once: as many as 16 burgers on the main grill panel, and 4 burgers on the direct heat firebox. The main chamber has a built-in smokestack, and as a super useful bonus, a built-in temperature gauge. The Char-Broil American Gourmet Grill’s smoker setup has several useful features: there are multiple adjustable air grates that carefully control the rate and temperature of the smoke that travels through the smoker grill. This allows for a great deal of control over the amount of smoke flavor imparted by the grill and the low heat transmission, as well as the ability to control the speed of cooking through the grill. This unit features a clean-out door for easy ash clean out. 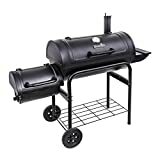 This grill is a powerful, flexible, and beautiful charcoal grill option, and is a great choice for the “beginner” smoker who is looking to learn about BBQ and smoking techniques. It is on the higher end side of these grills, though if you catch it on sale, you can get a great grill! The Weber 10020 Smokey Joe Silver Charcoal Grill is one of the classic grill options and is an excellent choice for the budget-conscious charcoal griller. The unit is very similar to the more expensive Weber One-Touch Grill above, though smaller, and without legs, for on-the-ground or tabletop use. The Smokey Joe’s small size and light weight make it ideal for portable grilling: camping, tailgating, beach use, etc. The unit has a 14.5″ diameter grate, and can cook food for 1-2 people at a time. It features a similar glass-reinforced nylon handle to the One-Touch Grill, and its lid also is unhinged but sits securely on the base. The porcelain-enameled coating protects the finish of the Smokey Joe grill against damage and heat wear. The unit features two air intakes to adjust airflow through the unit, one on the top, and one on the bottom (which doubles as a clean out mechanism). Clean out is easy using the bottom air flow intake to drop ash into the ashtray for disposal, and by closing both air intake valves, the coals are snuffed out very quickly. A small amount of assembly is required, though the assembly is simple, and the unit comes with a cooking guide with instructions on different ways to cook on the grill. The Smokey Joe Silver is made in the USA and is covered under a fantastic 10-year warranty.